Ensure the most accurate & uniform loads by precision measuring of cases & loaded rounds. A quick & convenient way to determine several important case & cartridge dimensions. 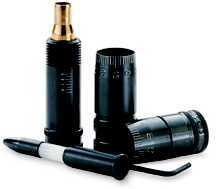 Range of 0-6" / 0-150mm. Direct .001" readings. Graduates .001" increments with 0.100" per single revolution of dial; 1.0mm bar scale. Four way measurements: outside, inside, depth & step. 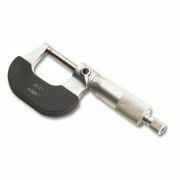 Comfortable friction thumb foller opens & closes calliper. Large, easy to read black numbers & marking on a white background. Case maximum & trim length chart included. Fitted clear plastic storage case included. Matte, non - glare finish. 0.100" direct reading per revolution. Shockproof movement for accurate measurements. Clear glass lens protects dial from dust & scratches. Slide may be locked in any position with thumb lock. Comfortable friction thumb foller opens & closes caliper. Lock screw holds dial in position for precise measurements. Quick & Easy to read. Enameled metal body with satin chrome thimble. White numbers on black background. 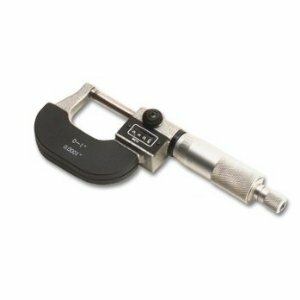 Outside micrometer has 0-1" range. Mechanical counter reads to .001". Resolution: .0001". Ratchet stop on thimble applies even pressure for measuring. Thimble lock stops thimble from turning when measuring like objects. Adjustment wrench included with fitted wooden storage case. Economical Version without all the "bells & whistles"
All metal body and thimble with silver matte finish. Crisp black numbers & markings for easy reading. Range : 0-1". Reads to .0001 of an inch. Ratchet stop on thimble assures uniform application of pressure when measuring. Thimble lock keeps thimble from turning when measuring a constant. Fitted plastic storage case included. Instant Reading.... Very easy to use. Hardened stainless body for prolonged tool life. Switches from inches to millimeters with the touch of a button. Range of 0 - 6" / 0-150mm. Large easy to read numbers which reduces errors. Adjusts to zero at any position. Measures internal, External, depth & step dimesions. Jaw depth measures about 1-1/2" outside, 5/8" inside. 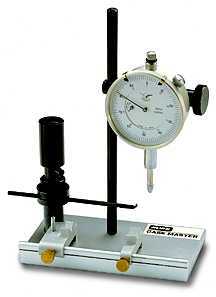 Lock holds slide in position for measuring constants. One replacable 1.55 volt type SR44W silver oxide battery included. Clear plastic fitted case included. 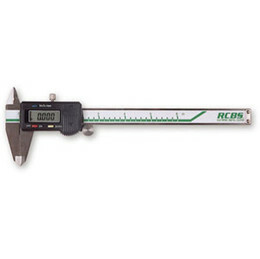 An indispensable tool for safety & accuracy. case shoulder to the base, giving you spot on ANSI/SAAMI tolerance readings.